Why People Fail to Attract Purple Martins Over one million North Americans maintain housing for Purple Martins. Unfortunately, only a small percentage of these folks successfully attract breeding martins. Below is a list of the top ten reasons why so many people fail. Your chances of attracting martins will greatly increase if you avoid making these common mistakes. 1. Housing placed too close to tall trees or in yards that are too enclosed. The main reason people fail to attract martins is that they place their martin housing incorrectly within their yards, or their yards are inappropriate martin habitat to begin with. Besides preferring their housing to be placed within a certain distance of human housing (see #3 below), martins also have very specific aerial space requirements. The air space immediately around the housing, at the height of the housing, should be unobstructed (i.e., free of trees) in at least a couple of directions, so that they can fly to and from the housing in nearly level flight. There should be no trees taller than the martin housing within 40 feet of it, preferably 60 feet. The farther the martin housing is placed from trees the better. If your yard violates this 40-foot rule, try mounting the housing higher relative to the trees, moving the martin housing to a more open area, or, as a last resort, pruning or removing some of the trees. 2. Landlord allows other bird species to claim the housing first. If any other species is allowed to settle into a martin house before martins at unestablished sites, those houses will rarely attract nesting martins. This is because birds set up territories around their nest sites and defend them against other birds. 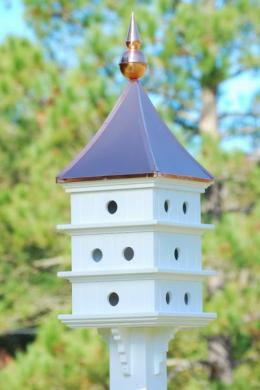 Should a House Sparrow, European Starling, Tree Swallow, Eastern Bluebird, Great Crested Flycatcher, or House Finch, etc., lay first claim to a martin house that didn’t house breeding martins the previous year, these nest-site competitors will repel any martins that are searching for nesting sites. Martins are easily repelled from entire houses at unestablished sites by the aggressive actions of nest-site competitors. Why? Because if a martin has never nested at a particular site before, it hasn’t developed site tenacity there. Without site tenacity, a martin is easily repelled. In contrast, once a martin has nested successfully at a particular site, it rarely will be intimidated from reoccupying that site the following year. To attract martins to unestablished sites then, prospective landlords must not allow any other species to claim the martin housing first. This might require repeated lowerings of the house for nest tear-outs, and in the case of the non-native House Sparrow and starling, trapping and/or shooting. Should native bird species try to take over your empty martin housing, temporarily plug all the entrance holes with paper cups, then put up single-unit housing elsewhere on your property. 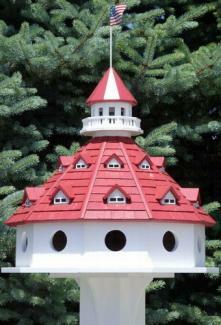 Once the native species have accepted the new housing, re-open the martin housing. 3. Housing placed too far from human housing. Research has shown that martin housing placed more than 120 feet from human housing has a lower chance of being occupied. This is because martins have “learned,” through natural selection, that the closer they nest to man, the safer they are from predators. Martin predators (i.e., snakes, raccoons, hawks, crows, and owls), tend to shy away from the areas immediately adjacent to human housing. Any martin that nests within this zone of human safety should have a higher probability of successfully raising its young. And, the closer a martin nests to the watchful eyes of its human host, the greater its chance the human will witness, and thus repel, attempted predator attacks. For these reasons, placement of martin housing way out in open fields, or next to isolated ponds, rarely results in successful martin attraction. Martin housing should be placed in the center of the most open spot available, about 30'-100' from human housing. If your martin housing hasn’t attracted nesting martins and isn’t placed within 100 feet of your house, try moving it closer. 4. Housing not painted white. Although martins have been known to nest in houses and gourds painted other colors, white housing seems to attract them best. First of all, housing painted white reflects the heat of the sun best, so martins choosing white housing lose fewer nestlings to heat stress. Secondly, white highlights the darkness of the entrance holes best, making the cavities more conspicuous to searching martins. And finally, white is believed to best enhance the male martin’s courtship display. Because of all these advantages, natural selection (and/or behavioral imprinting) seems to have favored the choice of white housing by martins. There are many examples of people who failed to attract martins until they painted their housing white. Even redwood and cedar martin houses should be painted white. Trim can be any color. 5. Housing opened up too early. Most ‘would-be’ martin landlords rush to get their martin housing opened up so as not to miss the arrival of martin “scouts” in their particular area. This is 4-5 weeks too early for unestablished breeding sites!!! Contrary to popular folklore, “scouts” are not looking for new breeding sites to lead their flocks back to. “Scouts” are nothing more than the very first martins to arrive or pass through a given area on their way back to their previous nesting sites. The arrival of migrating martins at all locations is a continual process spanning 10-12 weeks in the northern half of their breeding range and 14-16 weeks in the southern half, with new arrivals coming daily — the oldest martins arriving first and the youngest ones last. Older martins rarely, if ever, can be attracted to breed at new locations. This is because martins have tremendous fidelity to the exact site where they bred the previous year. It is usually only subadult martins (i.e., last year’s fledglings) that can be attracted to breed at unestablished sites, because they’ve never bred anywhere before and have developed no site fidelity. Subadult martins begin returning to any given area about 4-5 weeks after the “scouts.” Opening a martin house too early (or leaving it open all winter) just results in instant occupancy by nest-site competitors, a situation that often prevents martin colonization at unestablished sites. Prospective martin landlords should not open their housing until about four weeks after the first martins are scheduled to return to their area! The only exception to this rule is if a landlord has neighbors within about a mile that have established colonies. 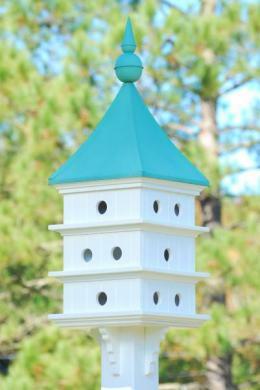 In this case, open the housing just as soon as your neighbors’ first birds have returned. There is a slight chance you might lure some of their adult birds away if your site (or housing) is far superior to theirs. 6. Failure to open the martin housing. In an effort to keep undesirable birds out of their martin housing, many ‘would-be’ martin enthusiasts leave all their entrance holes plugged ‘until the martins come around. This is a disastrous mistake at unestablished sites. Closed-up martin housing at sites that were unoccupied the previous breeding season will never attract martins. The only way that martins recognize potential breeding sites is by seeing open entrance holes, or by seeing and hearing other martins there. 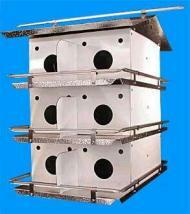 At unestablished sites, martins will not recognize, as potential breeding sites, any martin housing with closed holes. A few compartments should be left open on each side of the house. In contrast, landlords that had breeding martins the previous year can leave their housing completely closed up, if they choose, until the martins return and land on the housing. They can do this because Purple Martins exhibit a very high level of site fidelity — once they have bred successfully at a specific location, the same individuals return to breed there year after year. 7. Vines and shrubs are allowed to grow up under the housing. Unoccupied martin housing that has tall bushes and shrubs around the base of the pole, or has vines growing up the pole, will rarely, if ever, attract breeding martins. Martins tend to avoid such housing as it is much more accessible to predators, such as cats, raccoons, snakes, and squirrels. The solution is simple, remove the offending vines, bushes, or shrubs. 8. Housing not really ‘built to specifications.’ Many of the published plans for martin housing, and a few of the commercially-manufactured houses, are made to improper dimensions. Even some plans published in major encyclopedias, popular bird books, or by state and federal wildlife agencies are incorrect. If you consult ten different sources, you’ll often find ten different recommendations. Part of the problem is that no one has ever scientifically tested the martin’s exact nesting requirements and preferences, until now. The Purple Martin Conservation Association is currently conducting such research. Although not all the answers are in as yet, we do know this: A martin house must have compartments whose floor dimensions measure at least 6" x 6," but compartments measuring 7" x 12" are far superior. The entrance hole should be placed about 1" above the floor and have a diameter in the range of 2" to 2-1/4," although martins are known to use holes as small as 1-3/4." If your martin house does not have at least a 6" x 6" floor and at least a 1-3/4" entrance hole, modify it. 9. Housing attached to wires, or placed too close to wires. Martins love to perch on wires, but they tend to avoid houses that are attached to wires or are placed within leaping distance of them. They instinctively know that squirrels can crawl along these and gain access to the house. Never attach wires to a martin house, especially if they lead to trees, buildings, or to the ground.